Affiliate Links: If you click a link below, I may receive a small commission if you sign up. I pay for this subscription. Happy November! 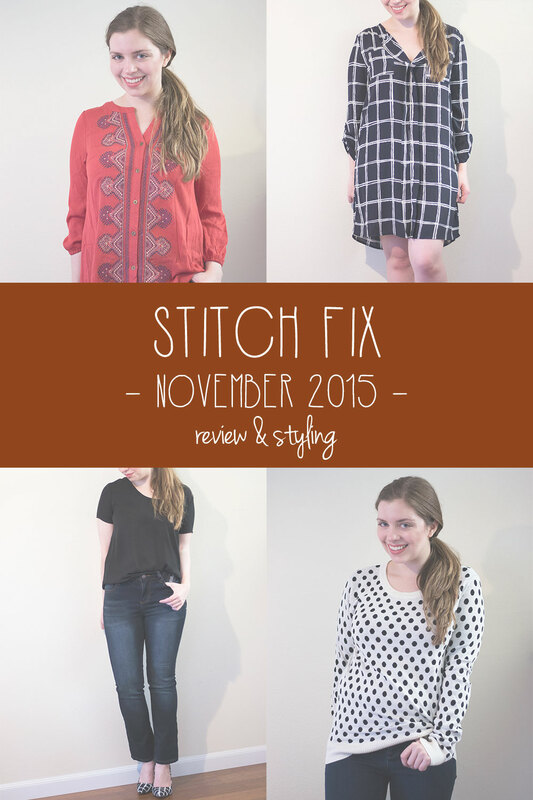 Of course I kicked off the month with another Stitch Fix. I’m always surprised at when these show up on my door step because it signifies another close to another month. Kind of bittersweet, but with November comes Thanksgiving, and we’re another month closer to Christmas, my favorite holiday of course! I won’t lie: this month’s Stitch Fix isn’t my favorite. My old stylist, Kim, seems to be MIA and I’m now being styled by Kate. While I think she did a good job of sticking to my style profile and following things I’ve pinned recently, I just am not blown away by any one piece. You’ll have to give me your feedback in the comments below, as I still have one more day to consider keeping any of the items! 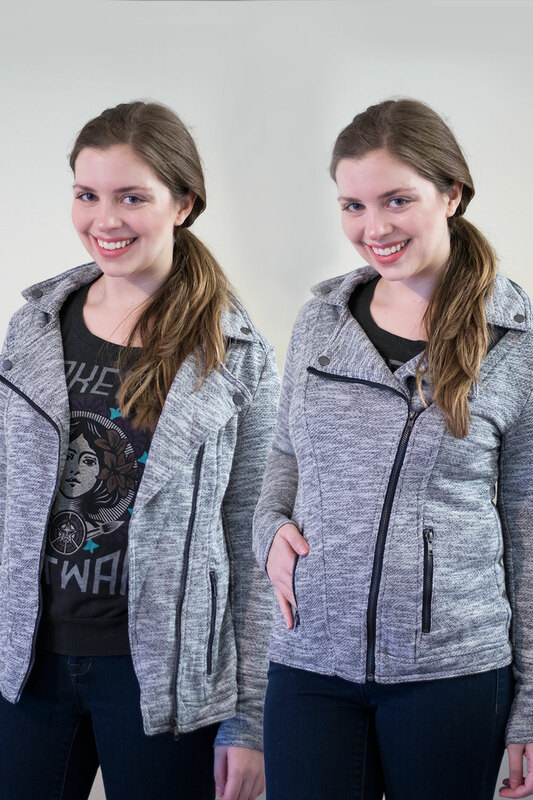 Without further ado, onto this month’s Stitch Fix! I like the concept of this top, however based on how wrinkled it was in transit, I have a feeling this is a bit more high maintenance then I’d prefer. It also has an open back which makes it a little too much of a spring/summer top for my taste. This was something I’d pinned, and I really like it in theory, but on me I feel like it’s far too boxy. I like the length and cut, but wish it was a bit more fitted at the waist to balance out the oversized print. I believe I may have pinned this as well, because it does look like something I’d like. However, with that said, I feel like it’s a little sporty for how I’d want to wear it. I think the same jacket in blush would be perfect. This is cute, but honestly not really my style. I do like polka dots, but something about this sweater doesn’t really feel me. As you may notice, the sleeves are very long on me, and overall it’s kind of a loose (but comfortable) fit. I really like the fit of these, but the cut is so weird! The straight legs almost flare out at the bottoms, which makes them look super strange with shoes on. If these had a tapered ankle, they would be perfection. So what do you think? Should I keep any of these pieces or send my entire Stitch Fix back? I’d love to hear your thoughts in the comments! So strange about the jeans- I definitely thought they were going to be more of a kick crop, not a straight leg! I love the dress, but am with you on the fit being a little too baggy/boxy, but still looks super cute on you! I actually really like the dress and think it would be adorable for holiday parties – add a colorful statement necklace or sparkly belt and you’re done! 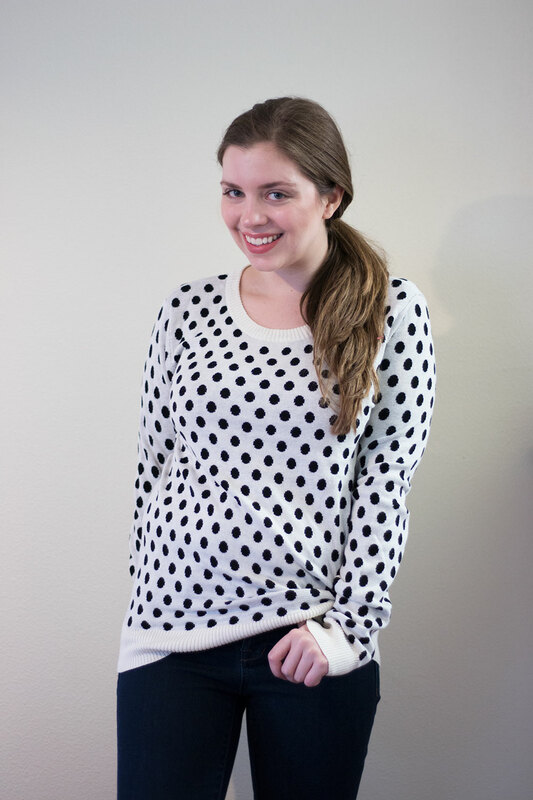 I actually got that polka dot sweater this month too and I definitely kept it! It fit me perfectly and it’s super comfy. Bummer you didn’t love it as much. oh i am obsessed with that polka dot sweater!! seriously, i think i pinned it 100 times and they never sent it. totally understand why you don’t love it though…. though i have literally never had anything be too long in the sleeves hahaha. my arms are so awkwardly long. anyway, i really like the jacket, but agree, it’s a bit sporty. Haha! It would be perfect for you! I’m sorry they didn’t send it to you though, that’s so annoying! Nothing is quite right, but I do love the jacket. Thanks Breenah, that’s how I felt too! Thanks Cat! I ended up sending it all back… oh well, will try again next month! I don’t like really anything they sent you! The closest thing I like is the jacket, but the coloring is off! What a bummer! Definitely a bummer month. Oh well, I’ll try again next month! The dress I like and think you can pair it with a vest or belt for a fitted look? I don’t think any of those are really homeruns or must haves. That’s why I haven’t signed up for Stitch yet. It seems like they are either on point or way off. Usually I have at least one piece in my box that I love, but unfortunately this month that wasn’t the case. It will be interesting to see if it’s better next month! I love the jacket, but I agree that a different color would have been better! Definitely! Oh well, maybe next Fix. I actually really like the polka dot sweater! 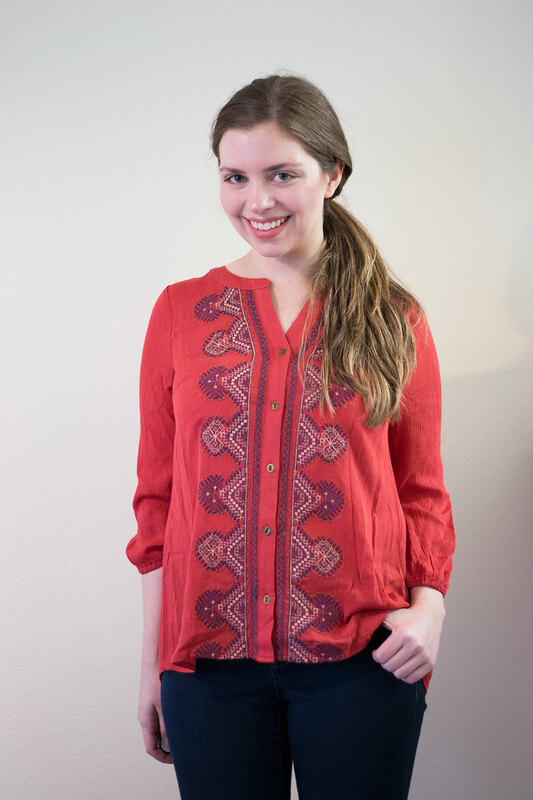 I think it’s cute, and longer sleeves can always be rolled up, or worn under a chambray. That’s definitely a good point! I decided to send it all back since I just wasn’t in love with anything. I pretty much agree with your opinions on those across the board! I just ordered my 1st Fix since March (gave up after too many 0/5’s), hoping I don’t have similar luck! I do think the grey jacket is really cute on you, but if you’re not loving it, probably no point in dropping that much $. My thoughts exactly! I did end up sending it all back, and if the 0/5 streak continues I’ll definitely be rethinking it as well. Hope you get a great fix, Crystal! I agree with all of your comments, although you can wear anything and look awesome. That first top is my favorite on you… too bad it is so high maintenance! Ain’t nobody got time for wrinkles! Aw, thanks Meg! I liked the first top, but wrinkly linen type materials really drive me nuts! I’ve been so disappointed in Stitchfix that I don’t have them coming regularly anymore. I like the dress, but it seems like it needs definition in the waist. Like the print is great. I love the polka dot sweater but it looks like something you could wait and pick up on sale at The Loft or The Limited. I like your fix a lot better than the last one I got, though! I miss the stylist that I used to have. My current one must not ever look at my Pinterest board! Ugh, what a bummer! I hope both of our next Fixes are awesome! Me too, sadly, so everything went back! First time in a longgg time. 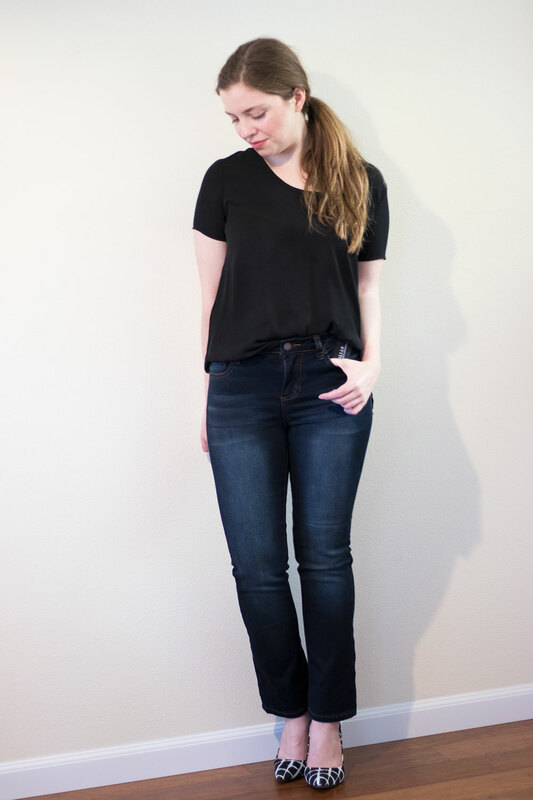 I think Stitch Fix continues to not get what a teeny, tiny person you are! I think that dress would fit two of you! I do really like the color of the 1st top on you, and I think the moto jacket would be cute if you needed something casual. Haha! Honestly it fit pretty well in the shoulders/chest, it was just unfitted in all the wrong places. I did like the idea of the dress and the other pieces, but since I didn’t love them I decided to send it all back.